The 24-hour race at the Nürburgring, Germany, sees 700 drivers in 175 vehicles compete while the brands and car sponsors take advantage of the 300,000 plus visitors and TV viewers. But to Falken Tyres, this race is an opportunity to do some heavy testing on its tyres to try and find any techniques that can benefit its passenger vehicle tyre developments. 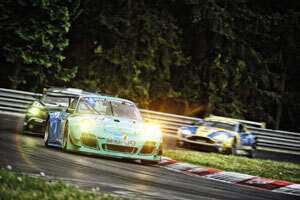 Falken’s EMEA Marketing Director Markus Bögner says that the N24 race is a chance to not only maximise the brand’s exposure, but also to learn as much as they can about the compounds and their performance, as well as auditioning to the vehicle manufacturers who brought teams to the race. The N24 race is unlike many others as teams can choose the tyre manufacturer they wish, whereas in other race series a tyre manufacturer is often specified. While the track has a multitude of different surfaces and cambers as well as uphill and downhill sections, which all play their part in testing a vehicle to its fullest, replicating a race tyre’s performance in passenger cars is not as easy as some imagine. Bögner says: “The surfaces on this race track are the same as on the street. You have to balance the tyre to work as good and as much as possible in different circumstances. While track to road developments are not common, Falken’s development for its 4×3 tyres saw the tyre bead construction come from the race car, after being modified by numerous race and car engineers. Overall, the 2015 edition was an interesting and varied show, and we look forward to the next in two years’ time.